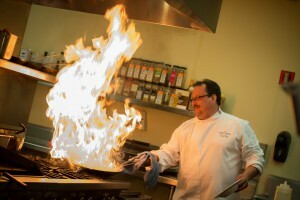 Raymond Evernham brings a wealth of experience to his role as Executive Chef at Poppy Ridge Golf Course. Originally a student of California Polytechnic State University in San Luis Obispo (A.A. Economics), he discovered his passion and diverted his education pursuits to the S.F. California Culinary Institute. Evernham is well versed in both classic French and Italian cuisines, as well as California farm-to-table fare. From a stint as head chef at one of NFL legend John Madden’s Italian dinner houses in Livermore, to the lead Executive Banquet Chef at the five-diamond Concord Sheraton, where he cooked for two past presidents. Sticking with politics, Evernham has executed multiple engagements for the California Air National Guard and Secretary of State of California, among others. Needless to say, Evernham is skilled on many levels of food preparation — and can execute both intimate dinners or complex gatherings of 200-plus guests.